Make Art. Make Money. Make Change. 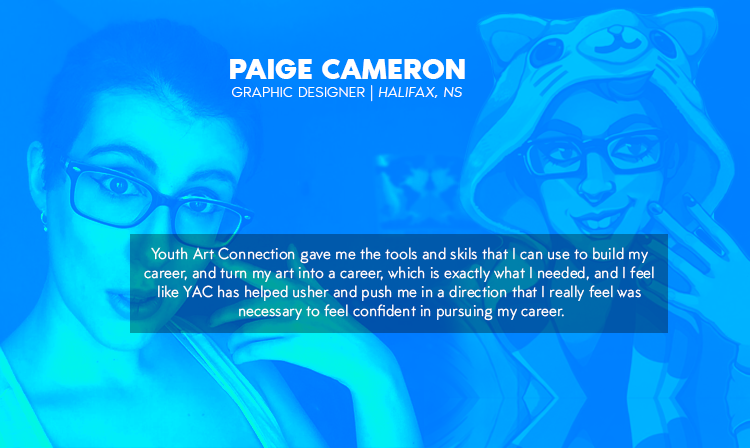 Youth Art Connection works with diverse, talented artists 30 and under, meeting them “where they’re at” and helping them grow businesses, social impact project and access careers and resources in Nova Scotia’s Creative Economy. Youth Art Connection’s vision is of a Nova Scotia where young, ambitious creatives can equally access the skills, knowledge, networks and opportunities needed to grow a successful arts-based career and life regardless of their race, gender, sexual orientation, country of origin, mental or physical ability level. The following four principles guide all of our programming and activities. The best way to serve youth is by listening to their needs, building programming based on their ideas and working with them to carry it out. Youth engagement ensures that programming remains relevant, up to date and effective in achieving desired impact with young people. The most impact on emerging creatives, their communities and our society happens when diverse people and perspectives come together. Different cultural backgrounds, ages, gender identities, artistic interests and views challenge us to innovate and adapt. The arts are perfectly suited for people 30 and under from diverse backgrounds to explore, learn and collaborate for personal and community growth. YAC is led by artists and entrepreneurs, and we benefit from a creative and action-oriented approach in all of our activities. Whether building on the artistic talents of youth, responding to an opportunity or designing creative solutions to complex social and economic problems, innovation is a core value in how we work. YAC has been able to have a greater impact because of our focus on partnerships and collaborations with organizations large & small, local, provincial or national. By connecting YAC youth to other organizations and opportunities we help them learn to navigate various community supports and sustain the impact of our activities. Many YAC programs are delivered by youth for youth. In 2012 YAC’s Co-founders Ryan Veltmeyer and Ann Denny collaborated to start Youth Art Connection(YAC). Being professional artists and entrepreneurs, Ryan and Ann knew well the struggle of trying to live a life as a creative professional, but also that with the right skills, knowledge and networks it was possible. After working with Arts Express at J.L. Ilsley Highschool in Spryfield in 2010/2011, YAC’s Co-founders realized that the struggle of building a life and career around creative talents was magnified for young people from marginalized communities. Some of the most talented young artists they met had no support for leveraging their incredible talent to build a productive and prosperous future. In particular many youth spoke to facing systemic barriers connected of their race, gender, sexual orientation, mental and physical health and economic background. Inspired by organizations like the Michaëlle Jean Foundation(Ottawa), The Remix Project(Toronto), Sketch(Toronto) & The Arts Network for Children and Youth(Toronto), YAC’s Co-founders created an organization focused on addressing the lack of support and infrastructure for emerging artists in Nova Scotia, especially those from marginalized backgrounds. It quickly became apparent that this challenge was not one YAC could address alone. Because of this YAC has focused on partnerships with other grass roots organizations, professional organizations and educational organizations that make up Nova Scotia’s creative economic infrastructure. In partnership with many groups throughout the province YAC has consistently and successfully worked to support young creative leaders and entrepreneurs to access and integrate existing infrastructure and to create and lead their own initiatives. A growing community of empowered and active young artists & alumni have emerged and are making their mark in professional art scenes across Nova Scotia and increasingly across Canada. Our staff and alumni are sought after not only for their artistic excellence, performances and art shows, but as thought leaders, speakers at conferences, consultants for professional arts organizations, educators for schools and other community groups, and each day bring more awareness and support to a new generation of artists, creative entrepreneurs and community leaders, especially from groups under represented in Nova Scotia’s creative & economic sectors.